Yes, that is a beautiful paper. Also the article on the SCREEN project by Manola Brunet et al.. Both would deserve to get a post here. Hi Zeke, that would be an interesting parallel measurement to analyze. We have asked Doeske whether we could put his data in our database. There should be two more of such comparisons in Minesota and New Jersey. 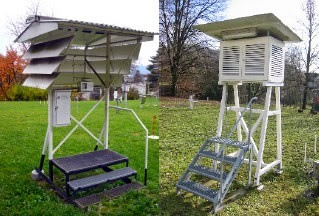 For the study of the transition of the Stevenson screen to automatic weather stations, we should be able to find quite some daily data. I already have 25 potential data sources on my list and I did not ask around much yet. Only Africa and Asia are still missing. The older transitions will be harder. Many parallel measurements have been performed, but the question is whether we can still find the original observations in the archives. The articles and reports typically only report on the monthly means. Brilliant idea. I, sadly, have not data to offer, but I would be interested to know if anyone has ever made measurements using standardised equipment to quantify the variation and correlation of temperatures over small to medium distances, say a few metres to a few kilometres? There is a siting experiment at Knoxville, Tennessee. Quite small scale. In several cities you have dense networks. For example: Phoenix Arizona USA (Chow, W.T.L., D. Brennan and A.J. Brazel. Urban heat island research in Phoenix, Arizona: Theoretical Contributions and Policy Applications.. Bulletin of the American Meteorological Society, 93, April, pp. 517-530, doi: 10.1175/BAMS-D-11-00011.1, 2012. ), Zurich Switzerland, Beijng, China (Chow, W.T.L., D. Brennan and A.J. Brazel. Urban heat island research in Phoenix, Arizona: Theoretical Contributions and Policy Applications.. Bulletin of the American Meteorological Society, 93, April, pp. 517-530, doi: 10.1175/BAMS-D-11-00011.1, 2012.). Jenny Linden of Mainz has made year-long observations with the same instruments in smaller villages. Will write a blog post about that hopefully soon. You may want to have a look at the work of Felix Ament of Hamburg, Germany. He is working with wireless sensor networks. They are not standard climate observations, but the wireless makes it easy to set up large networks and sample many locations. Probably already more people are working like this and I think we will see a lot more of this in the coming years. It is a great new tool. Being a fan of variability, I would try to sample many different distances and thus cluster the measurement locations. Most measurements are, however, spread as well as possible, which makes the estimate of the network mean more accurate, but makes studying the correlation function harder. If you work on this and would like to use our software to analyse the results, do contact me.